I hope your Thanksgiving celebrations were a success. My family enjoyed the day very much. Black Friday is a little too much for me, so I'll be staying firmly at home today. 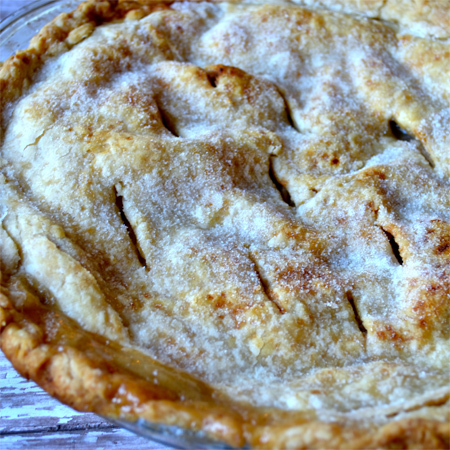 As promised, I wanted to share my family's apple pie recipe. It's a personal triumph for me that I tackled this recipe. It is one of those recipes that is strongly associated with my family's Thanksgivings and I was so pleased that it turned out just as it should. 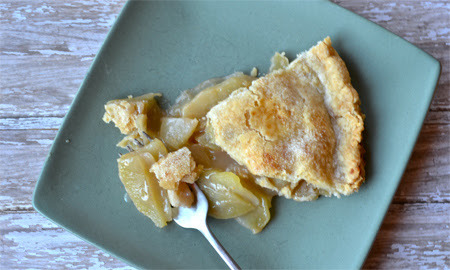 We brought my pie to D's family for the celebration yesterday, but fortunately, they aren't as in to fruit pies (and some are wary of "foreign kitchens") So, I was able to get my wish of having apple pie for breakfast today. Hooray! This recipe fixes all of those issues. 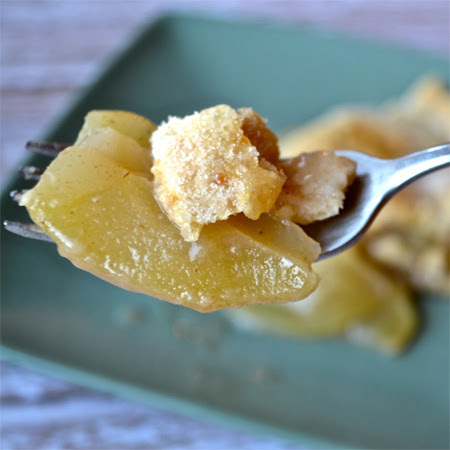 The end result is a pie that is totally balanced between sweet and tart, apples that have a good bite to them and a crust that is tender and flaky. I hope you'll enjoy it as much as my family. 6-7 tart baking apples (6 cups) We use Granny Smith exclusively. Pare apples & slice thin (about 1/4 inch). Combine sugar, flour, spices, & salt; mix with apples. Line 9 -inch pie plate with pastry; fill with apple mixture & dot with butter. Try to arrange the apples so that as they bake down, there won't be any holes created. Adjust top crust. Use a small amount of water to help seal bottom crust to top crust. Flute the edge and sprinkle with sugar, "for sparkle." With a sharp knife, slice several venting holes in the top of crust. Gently fold a strip of foil or pie tape around rim of crust, covering fluted edge. (This keeps juices in pie, guards against boil-over in oven and protects edge from over-browning.) Adjust oven rack to lower middle. Bake in hot oven, 425 degrees for 55-60 minutes or until top (and bottom) is brown* and apples are done. Place a sheet of foil on a lower rack if possible to catch any boil-over about 30 mins into baking. *Browning the bottom of the crust can be tricky and depend on your oven. Slight adjustment in temperature, and location of pie may be necessary. The above settings worked for my gas oven, but a temperature of 400 degrees may be sufficient for an electric (exposed element) oven. **Here's our favorite crust recipe. This is possibly the best crust there is. 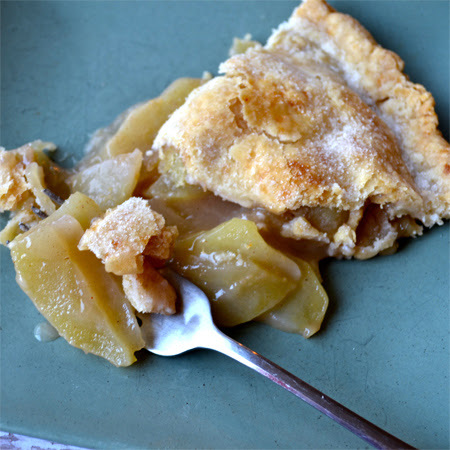 It is light, flaky yet tender and complements most pies very well. --Sprinkle water into flour and fluff with fork until dough comes together into a damp ball (not wet). Press into a ball. Flour hands and divide into 4 small balls. Roll out on a floured board to 1/8" thickness. Make sure to flour pin and board after each pass. Try not to over-work dough. Use crusts immediately or freeze with parchment in between crusts. For ice-box pies bake at 400 degrees for 8-10 mins. Cool then fill. For above apple pie, bake after filled. Enjoy and Have a Happy Day! Hi, I'm MJ. I'm a mom of three. When I'm not spending time with my kids, I like to make stuff and take pictures of it. I enjoy classical music, martial arts films and Korean dramedy. My house is a mess and I'm marginally okay with that. You can read more about me here. 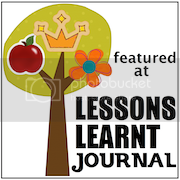 All photos posted on this site, unless stated otherwise, are the sole property of ahappysong.com. Please do not use the images contained here without express permission. Thank you! Header Image by shabbyblogs.com. Powered by Blogger.